Eggs can be found on various species of milkweed including common milkweed(pictured above), prairie milkweed, and the bloodflower. The female generally lays her eggs on bottoms of leaves, but she's been known to get high marks for creative egg laying. For those interested in raising monarchs from tiny eggs, it is very important to have a fresh supply of milkweed available or your caterpillar will crawl off to that big milkweed patch in the sky. 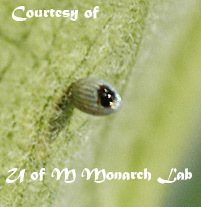 In nature, it is widely estimated that less than 10% of monarchs survive to reach adulthood. 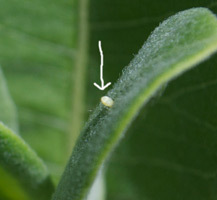 Many monarch butterfly eggs are eaten by predators including ants and spiders. Keep in mind they prefer fresh baby leaves, like the female pictured to the right. This is why it's a good idea to pull unwanted small milkweed plants from your lawn or you could be mowing down dozens of monarch eggs! I've been "trapped" into raising more monarchs than I planned on because I wasn't regularly weeding out these baby lawn milkweed. Now, I make sure to check the lawn every other day during the spring/summer months. As you can tell from the photo, they have no issue with laying eggs at ground level! If you can't find eggs on local milkweed plants, you always have the option of buying a monarch butterfly kit complete with egg(s). Just make sure you don't purchase more than you can handle. I'd suggest buying no more than 1-2 eggs for each milkweed plant you have access to. 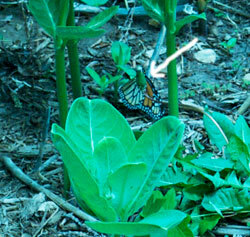 Also, think about your cage space when raising monarch butterflies...or more specifically, the caterpillars. For the caterpillar cage I suggested earlier, I'd say 8 is the maximum to raise at one time. The natives get restless when you overcrowd them and will be constantly climbing to escape the mass confusion below...not to mention all the excess caterpillar droppings! After you find/purchase your egg take a spray bottle and wet down the milkweed leaf so it doesn't dry out. Place the leaf in a small bowl and make sure there is no standing water. Repeat this process twice a day to insure egg survival. 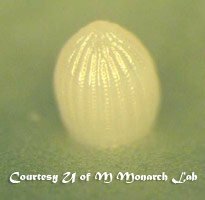 Congrats, you've raised a monarch butterfly...egg that is! Your adventure's about to get a bit more interesting with the emergence of your monarch caterpillar.